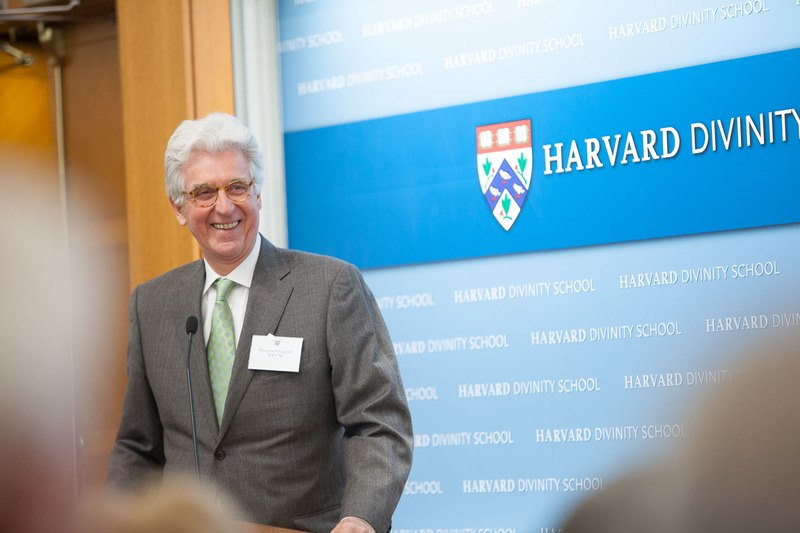 Harvard Divinity School dean David N. Hempton formally launches the campaign last week. President Drew Faust speaks on why the world needs HDS. The Harvard Divinity School may be one of the smallest graduate programs on campus, but because religion plays a major role in so many political and social conflicts around the world, the school’s value to Harvard as a whole has never been greater. That’s the message HDS leaders and President Drew Gilpin Faust are spreading as the school embarks on a $50-million capital campaign to renovate its core building, 103-year-old Andover Hall; increase the number of endowed chairs; boost financial-aid packages; and strengthen cross-disciplinary collaborations. 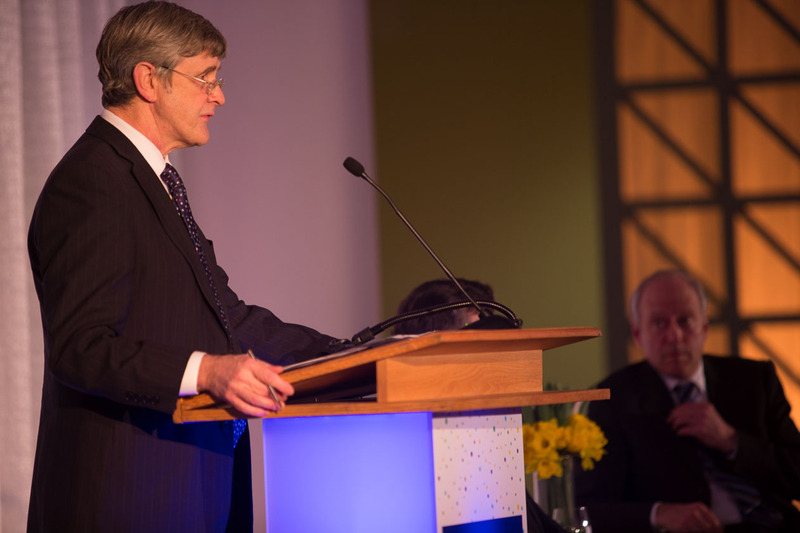 “[The United States engages] with Iraq, Iran, Afghanistan, and now Russia and Ukraine, armed with the best information that seasoned diplomats and ambassadors can provide, but still with very limited understanding of cultural and religious sensitivities,” said the school’s dean, David N. Hempton as he formally launched the campaign. “HDS cannot by itself reverse these unfortunate handicaps, but it can help remedy them—as it has in the past, and aspires to do even more in the future.” With increased funding, campaign leaders said, Andover Hall can become even more of a campus-wide center for learning and dialogue among peoples of all faiths. Hempton, Faust, and many Divinity School faculty and staff members and alumni gathered at Andover Hall last week to kick off the the formal fundraising drive. Its $50-million goal is less than 1 percent of the University’s overall fundraising goal of $6.5 billion, set last September. The campaign’s motto is “To Illuminate, Engage, and Serve” and so a primary goal will be establishing professorships in more “global” subjects, Hempton said, such as contemporary Jewish studies, Hebrew Bible, women’s studies, Buddhism, and African-American religious studies. Some funds will help support the the Dean's Fund, for discretionary uses such as cross-disciplinary collaborations, and be put toward cross-disciplinary collaborations and other new initiatives. Five percent of the goal will also go toward increasing financial aid and supporting off-campus field education. About 68 percent will be used for work on Andover Hall, constructed as a seminary in 1911, and 27 percent for professorships. The official launch began on Friday afternoon with an introduction by Tom’s of Maine co-founder and campaign chair Thomas M. Chappell, M.T.S. ’91, once praised by President Faust as someone who has turned his values into action. Campaign co-chair Susan Shallcross Swartz, an artist and activist who, with her husband James R. Swartz ’64, has donated $10 million to establish an endowment for Christian studies that will support new professorships, fellowships, and educational programs, introduced Dean Hempton, who then took the stage in Andover Hall’s Sperry Room and spoke about the future of the school, founded almost 200 years ago, in 1816. 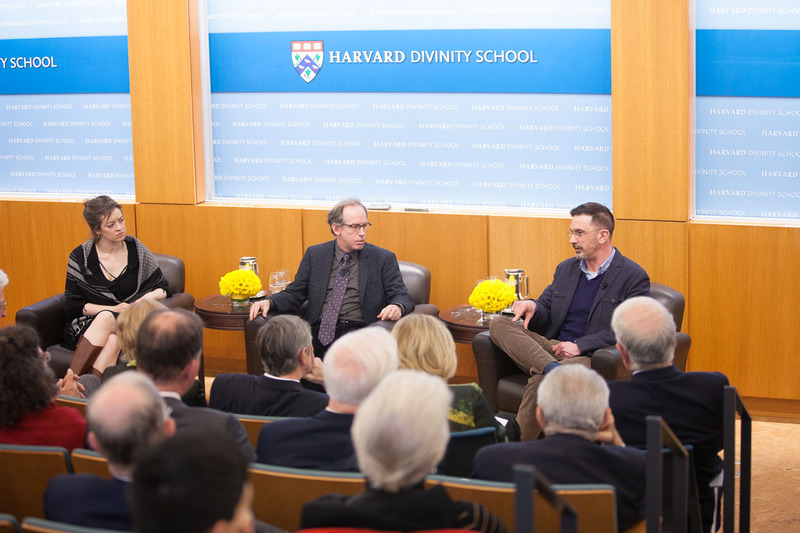 With material prosperity and instant gratification so often accepted as societal norms, said Hempton, who is also McDonald Family professor of evangelical theological studies, the core mission of Harvard’s founders in 1636—religion and spirituality—is often ignored. HDS, he continued, is the perfect institution to inspire today’s leaders to think about the most important questions in life, including death, the natural world, and spirituality. Houghton professor of the practice of ministry studies Stephanie Paulsell then introduced a panel on “Religion and the Literary Imagination,” exploring the nature of religious beliefs in novels and short stories. The session featured several writers, including pediatric oncologist Chris Adrian M.Div ’11, who discussed his novel The Children's Hospital, and C.E. Morgan M.Div ’09, a recipient of the National Book Foundation’s 5 under 35 award who spoke on All The Living, a novel she wrote while at HDS. In the “Religion and Human Rights” panel, Eileen Chamberlain Donahoe, M.T.S. ’84, described her work as United States Representative to the United Nations Human Rights Council in Geneva, the lead UN body responsible for the promotion and protection of human rights in places like Syria and Iran. Karen Tse, M.Div. ’00, a former UN human-rights lawyer, told how she had founded International Bridges to Justice while still at HDS, and how faculty members like David Little, Dunphy professor of the practice in religion, ethnicity, and international conflict, had encouraged her to believe that she could help end the use of torture as an investigative tool. Visiting professor of Christian social ethics Gary Dorrien and Bass professor of government Michael Sandel discussed ways in which religion and public life could be centered on social ethics. Dorrien gave a history of his field, which, he said began at HDS in the 1880s with the work of professor and former HDS dean Francis Peabody. He talked passionately about movements and people who had shaped social-justice efforts in the United States, including the labor movement and Martin Luther King Jr. Sandel, who spoke on the role of money and markets, urged those who work for social justice to become more comfortable bringing a moral critique to bear on issues like the widening gap between rich and poor, and cited Pope Francis’s November apostolic exhortation, Evangelii Gaudium, as an example. 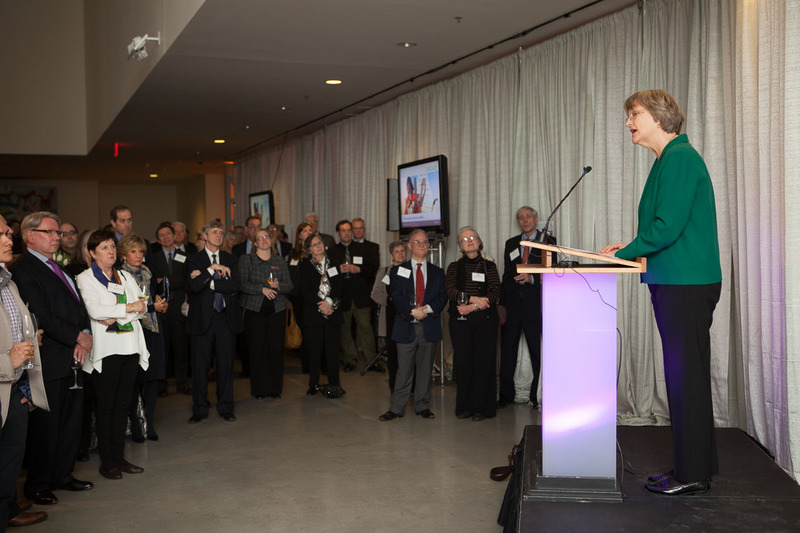 Before a reception in Northwest Labs later that evening, President Faust took the podium and said that the work of HDS plays a critical role at Harvard as well as in the wider world. Never have its subjects of inquiry felt more urgent—from the discussions of values and ethics buzzing across the graduate schools, to the tremendous appetite among undergraduates for the vexing question of how to live a life. How do we understand ourselves and our common humanity in a world more connected than ever, and yet profoundly shaped and often shaken by its contrasts and differences? As I have said before, veritas is not value-neutral. That is why we are here tonight. We need the Divinity School and the extraordinary community it creates.